Russian officials have said they thwarted a terrorist attack at a facility storing old radioactive components from nuclear vessels located in the Arctic — but don’t worry. It was just a drill. The simulated siege was part of a large-scale exercise called Atom-2018, and was meant to prepare workers at the Sayda Bay for the worst – an armed incursion into a sensitive facility within Russia’s vast but fragile nuclear waste storage industry, complete with bombs, hostages and political demands. According to reports, staff at the facility were alerted to the fact that the exercise was a drill. The purpose of the fake crisis, rather than scaring workers at a radioactive materials storage site, was to prepare officials from Russia’s security services to map out countermeasures specifically designed for the Sayda Bay site. Sayda Bay is a part of the Murmansk branch of RosRAO, the state operator responsible for the management and storage and handling of non-nuclear radioactive waste, as well as decommissioning nuclear vessels, especially submarines. Located 60 kilometers from Murmansk, Sayda Bay is itself an old Soviet-era military base. Since 2004, it has been tasked with storing reactor compartments from the dismantled submarines of Russia’s once overwhelming Northern Fleet of nuclear submarines. Later, facilities were built at Sayda Bay to handle and condition radioactive waste. Currently it houses about 80 single unit reactor blocks and has space for 40 more. Eventually, the site will hold the irradiated remains of the Lepse, a nuclear icebreaker refueling vessels that is carefully being pulled apart at the Nerpa Shipyard near Murmansk. Reasons Why a Floating Nuclear Power Plant in the Arctic is a Terrible Idea http://www.maritimeherald.com/2018/reasons-why-a-floating-nuclear-power-plant-in-the-arctic-is-a-terrible-idea/, BY SVILEN PETROV, -11 May 18, This enormous monstrosity is the first floating nuclear power plant built in the world. And now it’s heading to the Arctic. No, it’s not a joke or science fiction, it’s really happening. Russian Arctic glacier loss doubles as temps warm https://www.eurekalert.org/pub_releases/2018-04/cu-rag042518.php, CORNELL UNIVERSITY , 25 Apr 18, ITHACA, N.Y. – Ice mass loss in the Russian Arctic has nearly doubled over the last decade according to Cornell University research published in the journal Remote Sensing of Environment. The research focused on Franz Josef Land, a glaciated Russian archipelago in the Kara and Barents seas – among the northernmost and most remote parcels of land on Earth. From 1953 to 2010, the average rate of ice surface loss was 18 centimeters per year. From 2011 to 2015, the ice surface decrease was 32 centimeters per year, which is a water loss of 4.43 gigatons annually, said Zheng. For perspective, that much water would raise the level of Cayuga Lake — the longest of New York state’s Finger Lakes, at 38 miles — by 85 feet and inundate the cities of Ithaca and Seneca Falls. he Arctic has been warming in recent decades, but glaciers across the region are responding in different ways. “Previous studies have shown that the glaciers in northern Canada seem to be shrinking at a faster rate than the ones in some parts of northern Russia,” said senior author Matt Pritchard, Cornell professor of geophysics. “Our work takes a closer look at the Russian glaciers to understand why they might be responding to a warming Arctic differently than glaciers in other parts of the Arctic. Why glaciers in Franz Josef Land have been shrinking more rapidly between 2011 and 2015 than in previous decades is possibly related to ocean temperature changes,” said Pritchard. Support for Zheng’s research was provided by an Overseas Ph.D. Scholarship funded by the Ministry of Education, Taiwan. Both the north pole and the south pole are situated in the middle of huge ice deserts which are melting around the edges under the influence of human activity. The difference that matters between them is that the ice of the Arctic floats: if it melted nothing much would happen to aggregate sea levels. The ice of Antarctica, like that of Greenland, rests on land. If it all were to melt, as it has done in the far distant past, sea levels could rise by as much as 60 metres. That is most unlikely to happen. What is possible, though, is that the smaller portion of the continent, west Antarctica, which is divided from the rest by a mountain range, could lose much of its ice. Even that would be catastrophic. A significant retreat in west Antarctica, as seems to be already under way, could raise sea levels by between one and three metres by the end of this century. Children now alive will see that happen across their lifetimes. That is what is meant by the urgency of global warming. This week saw the publication of fresh research showing that the glaciers of west Antarctica are retreating faster than they were at the end of the last ice age, when water levels also rose significantly. The ice sheet is not one homogeneous mass, but a collection of glaciers all moving slowly but inexorably towards the sea. Their retreat is happening underwater, and invisibly, as the ocean erodes the foot of the glacier, known as the “ground line”, where its contact with the sea floor ends. Beyond that point, long tongues of ice stick out into the ocean, providing the coastline that we can see and map. But the capacity of the ice sheet to lock up water depends on the position of the ground line. As that retreats, invisibly, the sea level rises and the whole of the ice sheet grows less stable, something which makes further sea rise still more likely. Previous surveys have concentrated on a few of the glaciers that are an obvious danger but the research released this week analysed satellite data covering the whole of the coastline of west Antarctica to reach its worrying conclusions. The problem is worsened by the shape of the seabed on which the glaciers now rest. It does not slope towards the deep ocean, but inwards, forming a bowl of which the far side is the mountain range that divides the continent. That means that the process of erosion will be working downhill as it moves inwards, with faster and less predictable results. The present danger was discovered by measuring the thickness of the ice sheet from space and deducing from this the shape of the glacier beneath. This is much easier than knowing what to do. The contrast between the exquisite technological sophistication employed in the diagnosis of the problem and the lack of international coordination or political sophistication when it comes to solving it, illustrates the crisis of technological civilisation. As a species we have shown enough cleverness to disrupt the world’s climate, but may not have enough to remedy the damage that we’ve done. Things are of course made very much worse by the presence in the White House of an aggressively ignorant and anti-scienceadministration. Predicting the future of these changes isn’t an exact science, which is one of the things which makes them so frightening, but neither is it entirely guesswork. Ignorance about the size of the threatened rise in sea levels is no excuse for inaction. We know it’s coming. We know it will be disruptive. We don’t know if it will be catastrophic. But the possibility must spur us into drastic action on fossil fuels. Keep them in the ground. With Russia building floating nuclear reactors and possibly testing nuclear-powered cruise missiles, there are good reasons for this training.The Drive, BY JOSEPH TREVITHICKMARCH 20, 2018 The U.S. military, along with other federal and state authorities, has been training to respond to potentially dangerous releases of radioactive material in and around the Arctic. Though there is no clear indication of a direct link between Russia’s reported tests of nuclear-powered missiles or expanding use of nuclear power in the region, it is hard not to see these exercises in connection with those developments. t’s definitely no secret that the U.S. military has become increasing interested in preparing for potential conflicts and other contingencies above and near the Arctic Circle in recent years. As global climate change has shrunk the polar ice cap and otherwise reduced the amount of ice buildup that occurs during certain parts of the year, the region has become increasingly important economically and various countries, especially Russia, have moved to enforce their territorial claims. …….. the idea of a crashing satellite creating a radiological disaster isn’t an entirely fictional scenario. In 1978, the Soviet Union’s Kosmos 954 reconnaissance satellite, which had a nuclear reactor as its power source, crashed into Canadian territory, touching off an international incident and prompting an expensive response and clean-up operation. ….. U.S. military and other agencies practicing specifically to handle a radiological incident in the region seems even more noteworthy in light of a number of recent events. Most importantly are Russian claims that it has been testing a cruise missile with theoretically unlimited range that uses a nuclear reactor-powered propulsion system in the Arctic. Anonymous U.S. government officials have since told various media outlets that this is true, but that the weapons have been crashing, potentially spreading radioactive material and components. …… The Russians have also been dramatically expanding their use and plans to employ small and mobile nuclear reactors to support activities in the Arctic. ……..If any of these nuclear power systems were to fail, it could potentially cause a serious radiological incident that would impact both the United States and Canada. The same procedures American military and other government personnel have been training to employ in response to a crashed satellite would undoubtedly be applicable in those situations, too. Russia’s underwater nuclear graveyard – a great place for fishing? “We shall present soon a program on development of promising fishing in the Kara Sea,” said Sergey Golovanov at the 5th international conference of fishing in the Arctic, organized in Murmansk this week. He is quoted by news agency TASS. Golovanov is head of the Science and Education Department with the Federal Agency for Fisheries and has a background from PINDRO, the Marine research institute in Murmansk. According to Gulovanov, the Kara Sea’s advantage for the fishing industry is that it is a shelf sea, it does not border any territorial waters of other nations. “This is why Russia can have own fishing regulations there,” he said according to TASS. In 2013, a Norwegian-Russian joint study expedition to the dump-site of K-27 concluded that it is feasible to lift the ill-fated submarine from the seabed. Although dumped 30 years ago, the hull of the submarine is intact. Several other areas of the Kara Sea were also visited by the science expedition. Additional to the nuclear waste dumped across the Kara Sea, the waters are also next to the Soviet Union’s largest testing area for nuclear weapons. At Novaya Zemlya, 79 nuclear- and hydrogen bombs where detonated in the atmosphere between 1955 and 1962. In the period from 1963 to 1990 another 35 warheads were tested in tunnels under ground. Today, most of Novaya Zemlya is closed off miitary area. At the conference in Murmansk, nothing was said about the Kara Sea being the main dumping ground for nuclear waste during Soviet times. No other oceans worldwide have more dumped radioactive waste than Russia’s Arctic Kara Sea. 17 ships and barges loaded with radioactive waste are dumped here. So are 17,000 containers with radioactive waste. Even worse, along the east coast of Novaya Zemlya is 16 nuclear reactors dumped, six of them with spent uranium fuel still on board. With the breakup of the Soviet Union, both the military Northern Fleet and the civilian icebreakers stopped dumping waste at sea. On shallow waters in the Stepovogo Bay on the southeast coast of Novaya Zemlya, an entire nuclear-powered submarine, the K-27, was dumped in 1982. The submarine had then been laid-up for more than 15 years after one of the two troublesome reactors suffered a severe leakage of radioactive gasses and inadequate cooling causing extensive fuel element failures. Both Russian and Norwegian radiation experts have repeatedly warned that failing to lift the submarine eventually one day will cause leakages of radioactivity into the Kara Sea. A worst-case scenario has even pointed to the danger of an uncontrolled chain reaction that could be triggered inside the reactor in case sea water one day starts to leak in through the protecting cover that today isolates the compartment holding the two reactors. Britain Sends Nuclear Sub Under Arctic Ice As Tensions With Russia Heat Up, Sputnik News, 16 Mar 18, One British and two US nuclear submarines are taking part in a joint naval exercise currently underway in the icy waters of the Arctic Ocean. Armed with Tomahawk cruise missiles and Spearfish heavy torpedoes, the HMS Trenchant is the first British nuclear sub to be deployed under the Arctic ice in a decade. A new study looks at how much global sea level will continue to rise even if we manage to meet the Paris climate target of staying below 2°C hotter than pre-industrial temperatures. 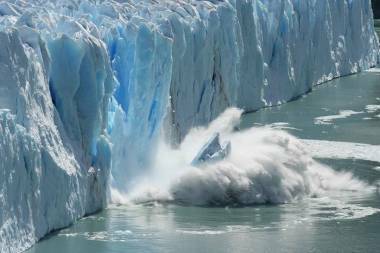 The issue is that sea levels keep rising for several hundred years after we stabilize temperatures, largely due to the continued melting of ice sheets in Antarctica and Greenland from the heat already in the climate system. The study considered two scenarios. In the first, human carbon pollution peaks somewhere between 2020 and 2035 and falls quickly thereafter, reaching zero between 2035 and 2055 and staying there. Global temperatures in the first scenario peak at and remain steady below 2°C. In the second scenario, we capture and sequester carbon to reach net negative emissions (more captured than emitted) between 2040 and 2060, resulting in falling global temperatures in the second half of the century. The authors found that global average sea level will most likely rise by about 1.3 meters by 2300 in the first scenario, and by 1 meter in the second. 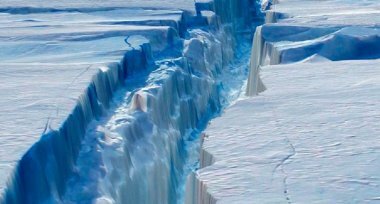 However, there is large uncertaintydue to how little we understand about the stability of the large ice sheets in Greenland and especially Antarctica. At the high end of possible ice sheet loss, we could see as much as 4.5 meters of sea level rise by 2300 in the first scenario, and close to 3 meters in the second scenario. we find that a delay of global peak emissions by 5 years in scenarios compatible with the Paris Agreement results in around 20 cm of additional median sea-level rise in 2300 … we estimate that each 5 years of delay bear the risk of an additional 1 m of sea-level rise by 2300 … Delayed near-term mitigation action in the next decades will leave a substantial legacy for long-term sea-level rise. And remember, this is all for scenarios in which we meet the Paris climate targets, which we’re currently not on pace to achieve. If we miss the Paris targets, sea levels will rise higher yet. Another new study, published in the Proceedings of the National Academy of Sciences, found that sea level rise has been accelerating. If the rate of acceleration continues – which the lead author notes is a conservative estimate – we would see an additional 65 cm (close to a meter above pre-industrial sea level) of sea level rise by 2100. Yet another new study published in The Cryosphere using satellite data found that while the East Antarctic Ice Sheet has remained stable in recent years, ice loss from the West Antarctic Ice Sheet has accelerated. Antarctica is now discharging 1.93 trillion tons of ice each year, up from about 1.89 trillion tons per year in 2008. When accounting for snow accumulation, the continent is losing about 183 billion tons of ice per year – enough to raise sea levels by about 3 to 5 millimeters per decade by itself. The melting of the Greenland Ice Sheet is likewise accelerating and is now responsible for about 25% of annual sea level rise (8.5 millimeters per decade). Meanwhile, the Arctic has been remarkably warm in February – as much as 35°C hotter than average in some areas. In mid-winter, when sea ice should be growing, in the Bering Sea it’s instead shrinking. The hot Arctic is important because the temperature difference between the Arctic and lower latitudes is one of the main forces that keeps the jet stream moving steadily west-to-east. With a hot Arctic, the jet stream is weakened, leading to weird weather in the USA and Europe. As a result, the western states have been experiencing relatively quite cold temperatures, while the US east coast has been unseasonably hot. To sum up, ice sheet melt is accelerating, as in turn is sea level rise. Even if we manage to achieve the Paris target of less than 2°C global warming above pre-industrial temperatures, we’re likely to eventually see more than a meter of sea level rise, and potentially several meters. The longer we take to reach peak carbon pollution in the coming years, the higher the oceans will rise. Disappearing sea ice in the rapidly-warming Arctic also appears to be causing increasingly weird and extreme weather in places like America and Europe. The north pole gets no sunlight until March, but an influx of warm air has pushed temperatures in Siberia up by as much as 35C above historical averages this month. Greenland has already experienced 61 hours above freezing in 2018 – more than three times as many hours as in any previous year. At the world’s most northerly land weather station – Cape Morris Jesup at the northern tip of Greenland – recent temperatures have been, at times, warmer than London and Zurich, which are thousands of miles to the south. Although the recent peak of 6.1C on Sunday was not quite a record, but on the previous two occasions (2011 and 2017) the highs lasted just a few hours before returning closer to the historical average. Last week there were 10 days above freezing for at least part of the day at this weather station, just 440 miles from the north pole. RIGHT now it’s an unprecedented 22 degrees hotter than normal in the Arctic, and in just two years the North Pole could be completely gone. “…….Santa is a fantasy but climate change is not, and it’s started to do truly alarming things to the North Pole. Over the past few weeks the temperature of the North Pole has been 22 degrees hotter than the average temperature for this time of year. That’s not a typo. It’s not 2.2 degrees hotter. It’s 22 degrees Celsius hotter. The reason it’s such a huge difference is because even though night is now falling, the temperature around the poles is still getting hotter rather than colder. That’s never happened before. What it means is that the gap between average temperature and this year’s temperature is getting wider and wider by the day…….. In salt water, minus five degrees (which is the current air temperature in the North Pole) is too warm for ice to form. That means the planet’s natural airconditioner (and sun reflector) is not regrowing back this winter. Two of the ways the earth keeps itself cool have just broken down…….. The ice caps melt because it’s getting warmer and then because the ice caps have melted, the earth gets even warmer even faster. In addition to the environmental implications, the cultural implications of this are also huge. We will need to start changing the stories that we tell ourselves and our children about what our planet looks like. The idea that ice was once at the North Pole will become folklore, much like the fabled North-West passage through the Arctic, which as recently as a decade ago was considered treacherous and impassable, but has now become a common route for ships and tourist boats in the summer months. This is why I’m seriously considering taking the kids out of school next July, and taking them up to the North Pole to see the ice. It’s probably the last chance to see it. Fantasies of the North Pole are such a vivid part of my own childhood. When was a kid, I always assumed I’d go there one day. Now I know my children will not. It will be warmer at the North Pole next week than much of Europe, as sea ice melts, Mashable, BY ANDREW FREEDMAN 26 Feb 18 In what seems to be becoming an annual occurrence, temperatures at the North Pole are about to reach or possibly exceed the freezing point this week as the North Atlantic and the North Pacific Oceans inject unusually mild air into the Arctic. Not coincidentally, Arctic sea ice is at record low levels, with a freak disappearance of ice off the western coast of Alaska, between Alaska and Russia. This vanishing of sea ice in the Bering Sea is exposing coastal communities in Alaska to storm surge flooding from typically fierce winter storms, particularly Little Diomede Island. …….. In Europe, winds known as “The Beast from the East” will transport frigid temperatures from Russia and Scandinavia to the west, into Germany, France, and the UK, along with potential snowfall. In part, this is because of a split in the polar vortex — that much hyped circulation of air at upper levels of the atmosphere that keeps the coldest air penned in across the Far North. One “sister vortex” has set up across Canada and the Western U.S., with another established in Eurasia. Many of these areas are colder than the Arctic is right now. study published in Nature about a 2015 sudden polar warming event found that these events are growing more intense, meaning that the temperature extremes are getting more extreme, especially when compared to the overall rate of Arctic warming.